The following screenshot shows the implementation. Turbolog4's Adjunct Activity box is attached and lined up to the left of a WSJT-X shell. Please note the highlighted calls. There is comprehensive logging and country information displayed for every prefix or call entry. The International Callbook is fully implemented and its information displayed in a separate line. Full DXCC information pops up on every call or prefix entered. Of course CAT transceiver control is available in both directions and fully integrated as well. In order not to miss an important Packet spot while logging the lower part shows a powerful Packet facility which …again… can be fully customized. It can even be completely closed in case there is no Packet avalable. The next screenshot just indicates one example of the kind of customizing that is available in TurboLog. This picture illustrates TurboLog4's comprehensive online Help system which is updated with every new release. A user's manual with full descriptions for all features is provided as well. This Packet working bench contains all controls for the full spectrum of Packet operations (Filters, Analysis, Alarms, Cluster Communication, etc… ). Packet Radio and Internet clusters can be connected all at the same time. Spots are analyzed and signalled by voice and/or CW alerts. 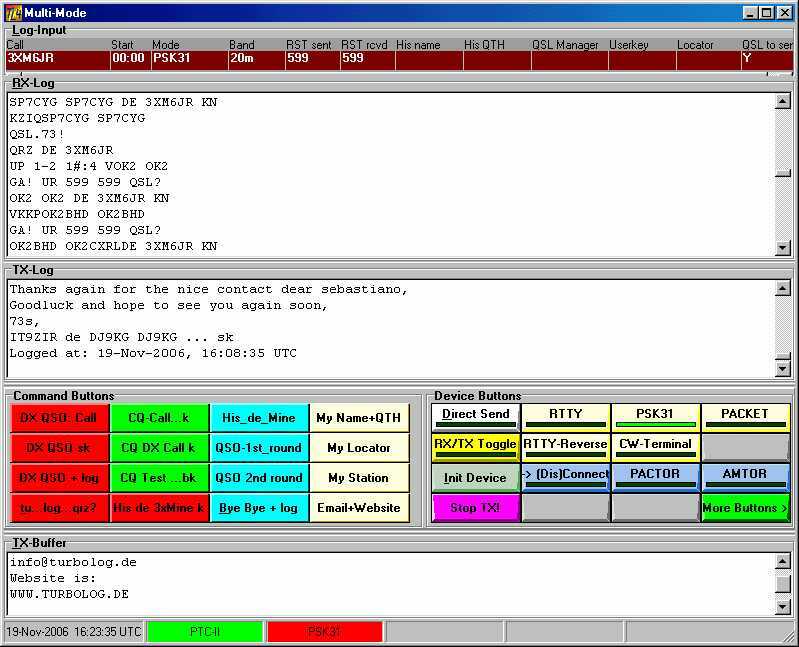 The upper frame contains all broadcast messages and alarms which were set on calls, prefixes and bands. 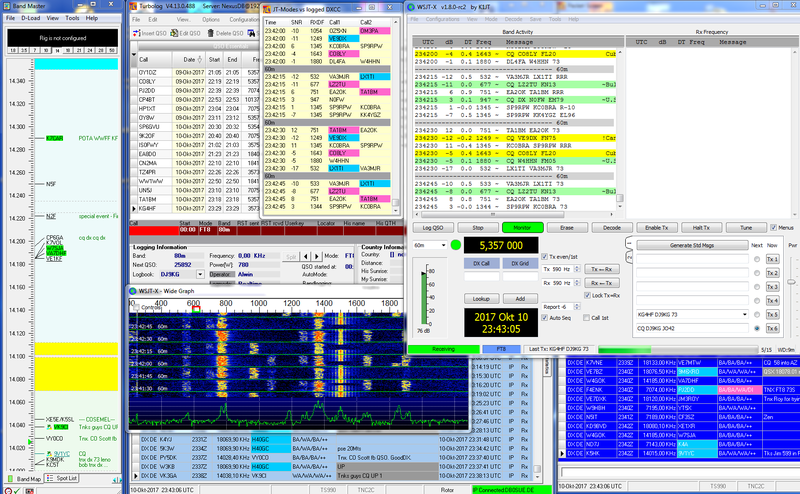 Full DXCC information which can be toggled by mouse click between Worked- and QSL-Status is displayed for every incoming spot. All spots are available in the lower Packet frame which can be scrolled and fully customized. Of course spots can be grabbed and automatically transferred to the logging fields. There is complete and automated interaction with the logging, CAT and Packet operations. Of course summaries can be displayed for every mode. The MultiMode Facility in TurboLog 4 is designed for running digital Modes such as RTTY, PSK31, PACTOR, AMTOR, PACKET, CW-keying, etc. by means of an external device. This approach does not depend on the PC's soundcard. It will normally already be heavily loaded otherwise with tasks such as Packet voice and CW alerts. Thus, TurboLog 4 allows you to turn on all audio alerts even while you are running the digital modes. This is a future proof approach without any pitfalls or restrictions. It makes full use of all the other features available in the program by integrating them into MultiMode operations ( automatic placeholders for all logbook input fields, etc. … ). This will not be feasible with any of the soundcard based methods which typically could only be integrated partly ... at best. Other devices can easily be included into the open architecture by the user himself. TurboLog provides excellent IOTA Support for the ambitious island chaser. The user can not only search for log records counting for the IOTA race and list his IOTA records in order to submit these records to the IOTA committee. Moreover, as shown in the screenshot below, IOTA achievements can be monitored in greatest details. Thus, if you come across a station e.g. from Indonesia and enter YB, a hotkey will instantly show you how you performed on all the islands belonging to this country and which potential islands the prefix or call under investigation may offer. This will help you to work the stations which you really need for increasing your IOTA count. The forestanding information provides just a very small portion of all the many other features. Just download and take time to test the shareware version. TurboLog4 is a living project. There is permanent developing going on in order to improve the product and to include new features as requested and suggested by the TurboLog4 usership.